275+ available channels, personalized home screens and DVR, voice control with Amazon Alexa or Google Assistant, access to your Nest security cameras, and even on-screen social content. All from the wireless company you love. A huge lineup with 275+ available channels, with the premiums, sports, local TV, and kids channels you want. Plus 4K content, and over 35,000 available On Demand movies and shows. Eligible home connectivity required. 155+ channels and 18,000+ On Demand titles included. Check to confirm service and channels in your area. Channels & packages can change. 275+ available, with 155+ included. 400 hours of DVR in HD. Plus, record multiple programs at once. And watch on any connected TV you add. Connect to your devices, including Amazon Alexa, Google Assistant, and Nest security cameras. Individual DVR, home screen, and profile for every user. Listen to music and access your subscriptions. View your Facebook photos and videos, and your Twitter feed right on your TV. Third-party subscriptions may be required for some content. No exploding bills. No B.S. Basic monthly set-top box/access fee required for both services ($10/mo. for TVision). Regional sports networks not currently available with TVision: Spectrum SportsNet, Spectrum SportsNet LA, Altitude Sports & Entertainment, MSG, MSG+. You’ll only see the shows you want with individual home screens and DVR. Use Amazon Alexa or Google Assistant to change channels, search your DVR, switch profiles, and more. 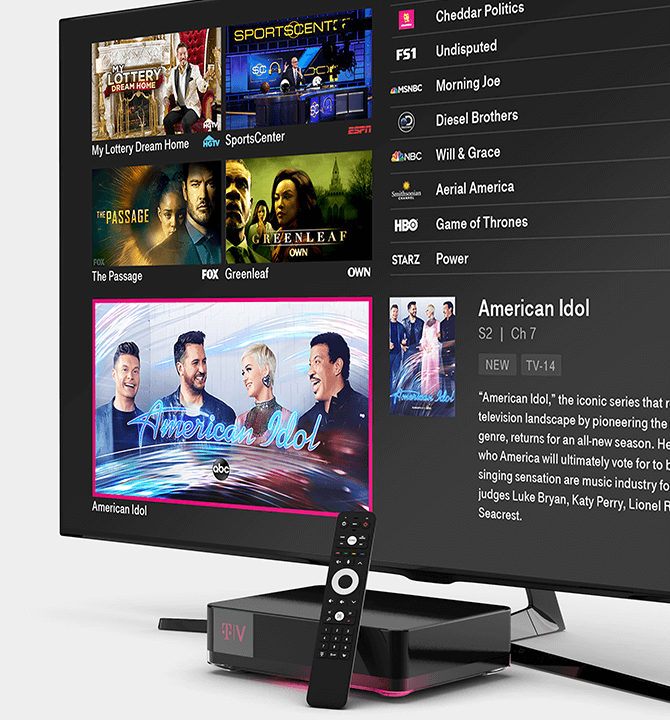 TVision’s compact Lite Boxes connect to your Set-Top Box over your home Wi-Fi—no extra cable jacks required. So you can watch amazing 4K and HD programming on every TV in your home. Stream all the music you want. Listen to millions of songs from thousands of artists on your TV, using your favorite music apps. Use TVision to access your favorite apps. 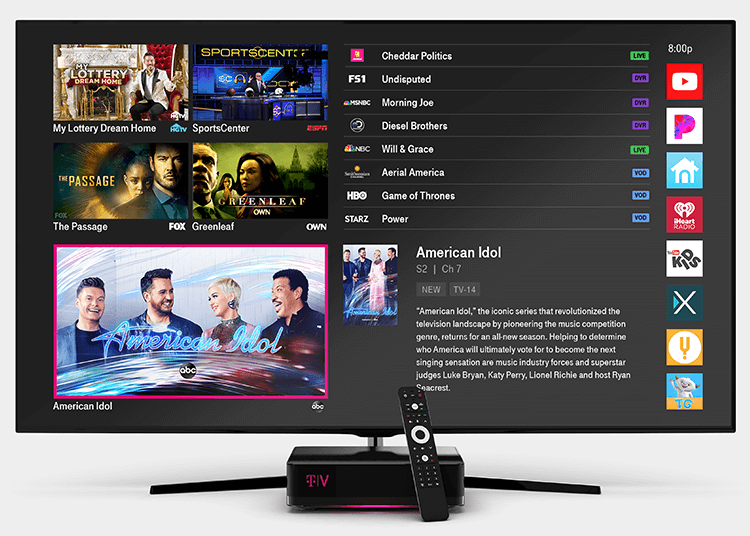 Watch shows, movies, and more from your favorite entertainment networks' apps using your TVision username and password. Select entertainment networks; via network app or website. 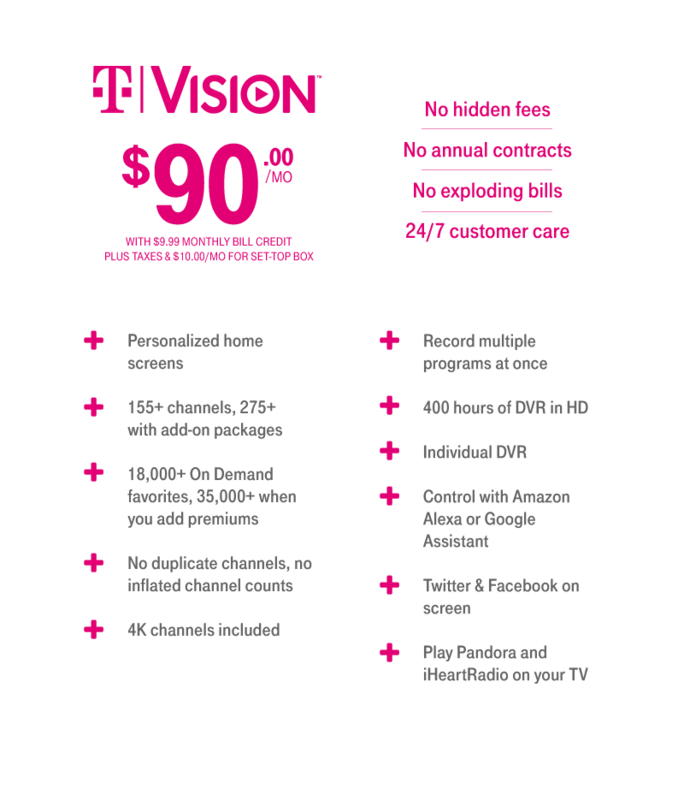 TVision Home service including entertainment network, capable device, and connectivity required. Third-party subscription may be required. Use of entertainment network websites and apps is subject network terms and conditions. Whoops! Something went wrong. Please try submitting your information again. Sign up now to find out more about TVision. By clicking submit, you agree that T-Mobile can call or text your number via an automatic telephone dialing system to let you know about TVision Home. Your agreement is not a condition of purchase. Stay tuned for more information about TVision.